Summer is over and Bootie knows it's time for school -- but that doesn’t mean you have to put your nose to the grindstone just yet! Bootie’s DJs will keep your minds off school all night long, throwing down the best mashups in the world to fill your minds with fun, not facts, while Hubba Hubba Revue presents a special educational variety show at 11 PM! Four rooms, one price! At 11 PM, Hubba Hubba Revue takes the Main Stage for a special educational burlesque variety show, while special guest Freddy, King of Pants (Bootie Seattle) joins resident professors EN8 and Rockit to give an education in mashup history, as they keep your bodies bouncing across the quad at DNA U! 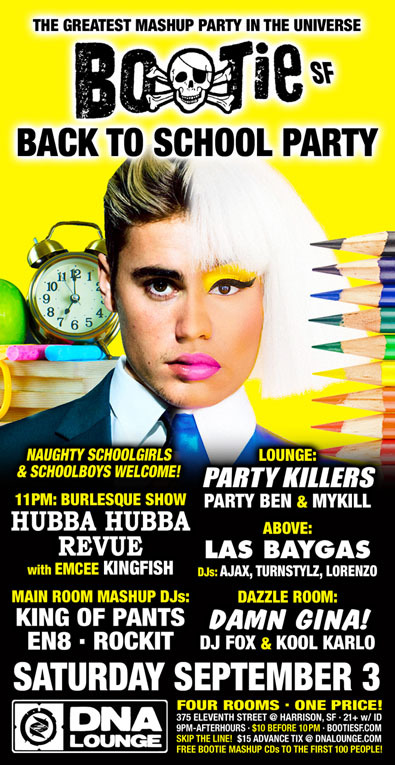 Upstairs in the Lounge, it’s Party Killers, with Party Ben and Mykill, as the pair throw down house remixes and more to make you dance, while in Above, Las Baygas brings Vegas-style bangers to get you on on the dance floor, and Damn Gina spins super fun dance music in the Dazzle Room. All this, plus drag hosts Suppositori Spelling, and Qween, club photography by ShutterSlut, and FREE Bootie mashup CDs to the first 100 people through the door!